Ireland has long been an exacting test of the moral quality of British statesmen. Northern Ireland was a rare blot on the long record of honourable public service of Lord Carrington, the former British cabinet minister, who died last Monday aged 99. In 1971, as defence minister in Edward Heath’s government, he approved the use for IRA suspects of techniques of interrogation, such as deprivation of sleep, wall-standing, hooding and subjection to high pitched noises, designed to disorientate and extract information. These led to Britain being found guilty of inhuman and degrading treatment – but not torture – by the European Court of Human Rights in a case brought by the Irish Government. Throughout the proceedings leading to that verdict, the British government refused to reveal who had sanctioned these practices. This left the impression that elements in the security forces were on a frolic of their own that had been corrected by government as soon as it knew of it. Those responsible were never held to account for what were criminal assaults in British law. Carrington was unapologetic about the role of the Army shooting down 13 civilians in Derry in January 1972. In his memoirs, Reflect on Things Past, published in 1987, he wrote that “the troops made what in any other country would be regarded as a pretty restrained effort in defending themselves”. It was from Ireland that he derived his title. His late 18th century ancestor, a self-made draper turned banker from Nottingham, who supported William Pitt in parliament, was fobbed off in 1796 with an Irish peerage giving no right to sit in the British House of Lords. The British peerage came later. It was this peerage, to which he succeeded in 1938 at 19 on the death of his father, which enabled Carrington to pursue a political career without ever having been elected to the House of Commons. Born Peter Carington on June 6, 1917, he had what he described as an uneventful, happy and dull boyhood in rural Devon, punctuated by school at Eton where he did not shine either academically or at sport. Commissioned in the Grenadier Guards, he fought on the Western Front in the final year of the Second World War. He was awarded the Military Cross for an exceptional act of bravery crossing the Rhine in a tank, a fact which, with characteristic modesty, he did not mention in his memoirs. His warm relationship with the working-class soldiers who served under him fashioned him as a “one nation Tory” disposed to create a more caring society. “Will you join my shoot?” said Prime Minister Winston Churchill, offering Carrington a junior ministry in the department of Agriculture when the Conservatives returned to government in 1951. After three successful years as High Commissioner to Australia, where his father had been brought up, Carrington became First Lord of the Admiralty under Harold Macmillan in 1959 and entered the cabinet as Leader of the House of Lords when fellow aristocrat Alec Douglas-Home became Prime Minister in 1963. He was highly influential in cabinet when the Conservatives under Edward Heath returned to government in 1970. As a one nation Tory, Carrington was out of sympathy with the right wing ideology of Margaret Thatcher who succeeded as Conservative leader after they had lost the 1974 and 1975 general elections. He was surprised but much gratified to be appointed Foreign Secretary when she became Prime Minister – “the summit of my ambitions”, he said. His languid relaxed manner, charm, sense of fun and ability to relate to all-comers equipped the sharp-featured Carrington for diplomacy. He displayed his capacity for conciliation negotiating the end of the war in Southern Rhodesia with a settlement that displaced Ian Smith’s white minority government and opened the way for elections with universal suffrage. These resulted in the rebel leader Robert Mugabe becoming prime minister of the new Zimbabwe. It promised better than it turned out. 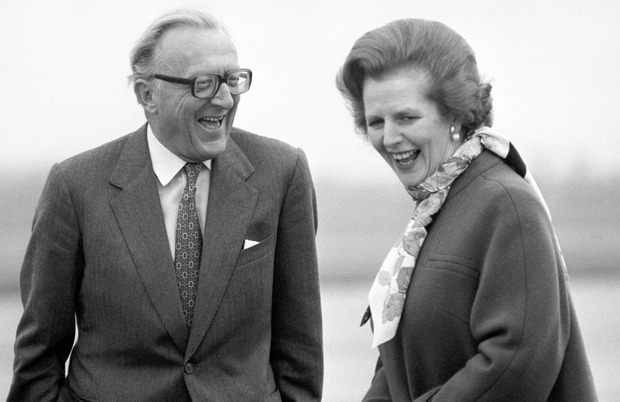 Carrington was also involved in the search for peace in Northern Ireland, accompanying Prime Minister Margaret Thatcher to her meeting with Taoiseach Charles Haughey at Dublin Castle in December 1980. He resented Northern Ireland being regarded in Europe and America as a colonial problem when the majority there wanted British rule. “How can we unite Ireland?” he once exclaimed to Garret FitzGerald; Carrington’s personal preference was for a united Ireland linked to Britain by a defence pact but Irish obduracy blocked the way. It was a not wholly dissimilar problem in the Falkland Islands that in 1982 proved his undoing. His officials had been in contact with the Argentine government seeking a solution that would meet their claims for sovereignty, while respecting the right of the islanders to keep the islands British. They failed to anticipate that the military junta in Argentina would suddenly invade the islands. When this happened, Carrington took full responsibility rather than blame officials and resigned immediately. By so doing, he shielded the government and copper-fastened his reputation as a politician of invincible honour. Carrington became Secretary-general of Nato from 1985 to 1988 and in 1991 negotiated a ceasefire in Bosnia that, to his disappointment, did not hold. Hating insularity and a veteran of the government that had brought Britain into the European Communities in 1973, he was critical of the growing Euro-scepticism within his party. In 2000, he was one of a group of senior Conservatives to criticise their leader William Hague when he ruled out for 10 years membership of the European Monetary Union. Carrington married in 1942 Iona McLean, the daughter of an army officer. They lived in Buckinghamshire where they had a farm of 350 acres, a well-tended garden and dogs with names like ”Winston” and ”Margaret Hilda”. Lady Carrington died in 2009. Carrington remained fit in body and mind into old age. He is survived by two daughters, Alexandra and Virginia, and one son, Rupert, who inherits his Irish and British peerages.